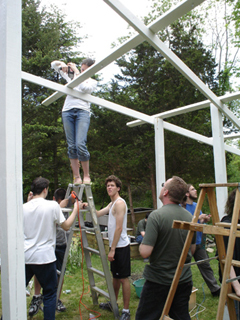 In 2005, we started with the same basic tower concept as in 2004, but with the addition of a telescoping arm. The tower was redesigned as well and worked much better than the 2004 tower - simpler, easier to construct, and more resilent. We "matured" our drive team concept to choose a single drive team for all competitions. During time trials for competiting drive teams two teams of driver's stood out and ended in a dead-heat. One team would set a new fastest time and the other would come back with their own faster time, back and forth! Finally with the two teams such a very close match, but having to go with a single team, it all came down to a coin toss the day of practice at our first competition. Chris Saunders/Liz Lanzarone became our drivers and the others became the human players. We also chose to go with a mature student (Junior-Pat Cloke) as our field coach, so for the first time we had an all-student drive team. It was a fateful choice to go with a single drive team that proved it's worth when we took gold and silver medals at our Regional competitions. Our best year ever. It continued to prove it's worth when we repeated that performance the next year in 2006. In the Long Island Regional, we ranked 10th in the qualifying rounds and became Regional Champions after being chosen by the Red Dragons of Team 527 Plainedge H.S. and allied with R.I.C.E. Team 870 Southold H.S.. In addition we were awarded with the most prestigious award FIRST gives - the Regional Chairmans Award, recognizing what we did on and off the field. Our second regional, the Philadelphia Regional started only a few days later. 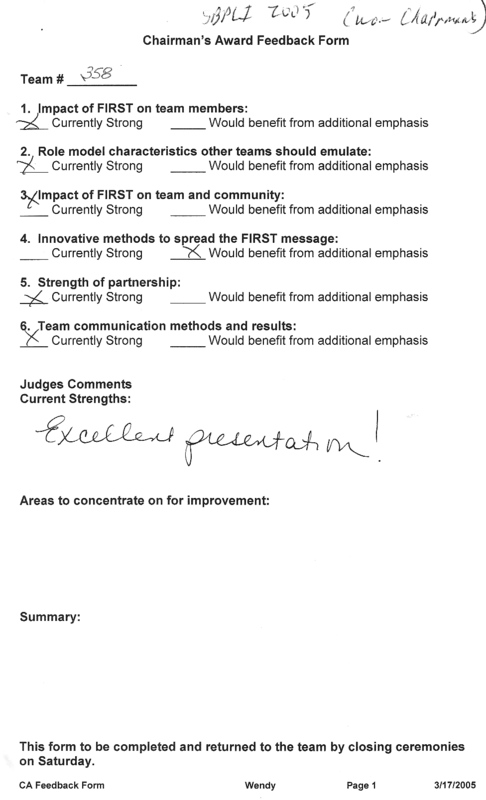 At Drexel University we did well, finishing the qualifying rounds in 7th place. We teamed up in a great alliance with 6th place Hopewell Valley Central H.S. 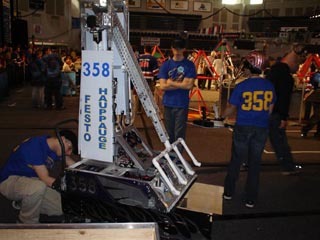 (Team 293) in Pennington, NJ and Southern Lehigh H.S. (Team 834), Center Valley, PA advancing to the Finals without a single loss and winning by large margins before falling to the Regional winners, but taking the Finalist trophy. At the Championships we placed 14th in the Galileo Division, but were not invited to the finals, although our drive team and robot did have to wait on the field as alternates. In the Fall we won the Deer Park Invitational held at Long Island's Deer Park H.S. partnered with Miller Place H.S. (Team 514), and William F. Grady Technical H.S. (Team 369) from Brooklyn. We followed up with a victory at the Brunswick Eruption hosted by team 25 in North Brunswick, NJ. 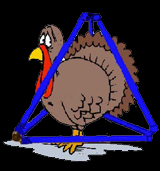 We were partnered with Hillsborough High School (Team 75), and 369, William F. Grady Technical H.S. (again). During the 2004/2005 season we increased FIRST and team visibility around school with appearances at Homecoming, Oldies concert, and Safe Halloween. At Homecoming the robot autonomously waved our team banner at the end of the parade and at the team sale table. We didn�t hold regular team meetings in the Fall, just organization get-togethers prior to special events. We competed in the annual SBPLI mini-competition to expose rookie team members and teams to FIRST robotics. SBPLI played a modified game on an open field with lumpy carpet we would get snagged on with our �� ground clearance. We participate in the two West Islip sponsored workshops for the second year with different freshmen to increase cross-team exposure and to kick-start our freshmen. We in turn loaned our 2004 robot and team engineers and advisors to support a rookie workshop on all things robotic at our sponsor Festo�s facility. Robot and team members demonstrated at an SBPLI fundraising dinner in East Meadow where the robot rose up out of the floor and autonomously attacked a Festo laptop (it stopped just shy and the laptop was saved by Mr. Tiu�s diving catch). A lot of effort was spent developing and refining our computer database Scouting program. The robot was particularly well traveled, team members also loaned the robot to Hofstra�s engineering dept. to familiarized students and faculty with the robot sub-systems, and help to stimulate interest among the engineering students. The robot demonstrated at I-CON at Stony Brook University with several other teams between our last Regional and Championships. Finally, the 2005 robot took over and visited Northrop Grumman after Championships to help enlist new mentors and to demonstrate a FIRST robot to the newly recruited mentors. New mentor recruiting at Northrop Grumman lead to team advisor conducted pre-season weekly FIRST mentor lunchtime workshops exposing new Northrop Grumman mentors to the various robotic sub-systems and to the FIRST program goals and objectives. We also helped hookup new mentors with needy rookie teams. Team mentoring involved three new rookie schools: 1546 Baldwin, 1607 Roosevelt, and 1537 Uniondale. Rookies were all gifted with two practive 12v batteries and competition port Kill/Autonomous switches. Assistance was provided to veteran teams in degrees varying from a couple of visits to check out faulty hardware to supplying tools, materials, and some finished products as needed:1468 Hicksville, 810 Smithtown, 1606 Levittown, 527 Plainedge. We ourselves took advantage of Smithtown�s milling capabilities to refine and correct some of our parts. The Booster Club was as busy and productive as always. We sold team silly putty eggs at Homecoming after the parade (not a big money maker), one Oldies concert could not get the acts we wanted, however, the promotor made a substantial donation in return for our efforts, but lotto made money, and the ever popular 50/50 always brings in cash. Especially, when the winner donates some of the cash back to the club! SBPLI was our first Regional again, followed a week later by the Philly Regional. 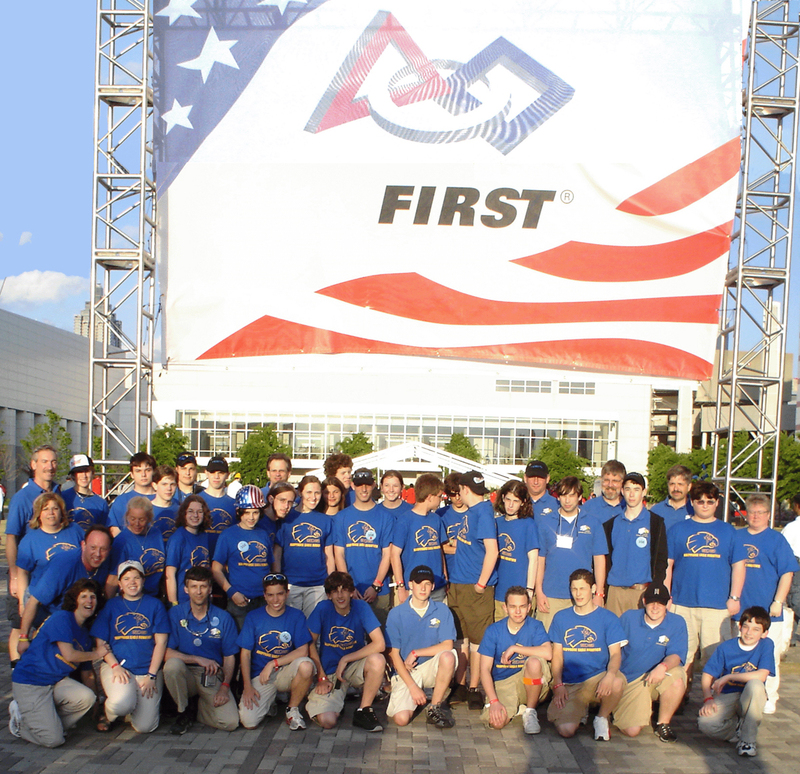 With the three-day turnaround between events the robot crate arrived on the Philly loading dock the evening before competition AFTER the dock workers had gone home. It spent a lonely night out on the dock. We overcame disappointment in Atlanta as probably our best robot remained unchosen for Finals and we had to sit on the sidelines as the second alternate. After the season but before school let out for the summer, we participated in one of our team member's Eagle Scout project. We cleared an area outside a picture window in the BOCES elementary school nature education center, then raised posts to support a sprawling bird feeding station, so the children could watch the birds feeding. No summertime activities where planned, and no robots did any visiting until the Fall. Our Team giveaways were silly putty eggs for the second year. Booster Club fundraising involved a one night Oldies concert that unfortuately fell through when the promotor could not get the desired acts, however, the promotor came through with a significant good faith donation. We tried selling our team silly putty eggs, but the price ($2) seemed too high.